So this afternoon I sort of pulled out a bunch of my worsted weight yarn that’s been waiting for colour-work projects for, oh, ever, and started pondering it. Maybe this weekend I’ll cast on for a colour-work sweater or three. 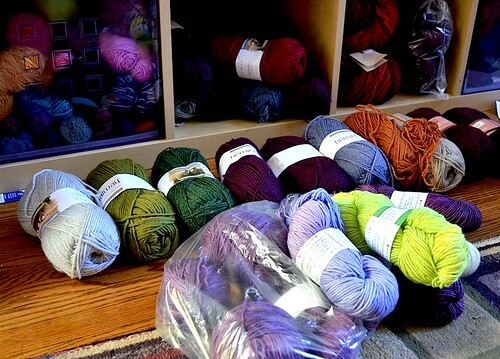 Or, maybe I’ll just take out more yarn and look at it. (One can’t ever discount this as an enjoyable time in and of itself.) As you might guess, I’ve got a bit of a purple/yellow-green fascination going on and might finally be ready to take the plunge there. What colours are fascinating you this week, dear knitting friends? I love taking out my stash and thinking about all the things that I can make. There is something wonderful about all the potential energy held in a skein of yarn: energy pent up and waiting to be unleashed. A lovely green is a color that always fascinates me but this week I’ve also been admiring an unexpected, bright magenta (more pink than purple). I know what colours look good on me, but when you go into a yarn shop you find colours you never even knew existed. I never know what I’m going to end up with. Current project is green, but I’m loving your purples! I just love going through yarn, pondering the next thing to cast on! Right now I’m recovering–or at least trying to–from a bout of startitis, so I’m not allowed to cast on, but I think I’ll survive. I think. One of the newest things on my needles is a Noro sweater, so right now my favorite colors are all of them!! I’ve never knit a sweater out of Noro before, and have in fact actively disliked them, but I’m completely in love with this guy. I see a series of brightly colored, stripey sweaters in my future! Next project, red (I can’t resist a red sweater, no matter the season). I have a stash from last summer’s trip to France, but people kept having babies who needed sweaters, and then there were other projects begging to be finished. Finally, red’s next. Purple and green is a great colour combination. I think a sweater in those colours would look fantastic! Can’t wait to see what project you decide. I am pondering ocher and dark grey. I want to knit something with ocher and grey stripes. Still torn between a cardi and a triangular shawl/wrap. Recently I’ve been adding golden hues to my stash but it is so not my color. I tend to stick with darkish solids — plums, wines, charcoals — but now that spring has sprung, I need to stretch my palette and add some lighter tones. Do it. Cast on for a purple/green project. I’ve been really into green recently. It’s strange because I have a hard time wearing lots of greens. Most of my stash is blue. I happen to adore purple and green together go for it! Oh I love looking at my yarn! I wonder what wonderful things you are going to knit next. I am wondering, how have to put together your crafting space? I finally have a room all for my use dedicated to crafting.I have never had this before! So I am looking for all sorts of tips! I tried to explain to someone once that I go through color phases and that my favorite color changes depending on what’s got my attention that month. Right now I’m fascinated by olive greens, which is a little disconcerting as I’m not generally fond of greens. I’m definitely intrigued by deep pinks with a little blue in them. I’m in love with deep and vibrant blues. And I’m a bit off reds just now. That’ll shift again. Just wore myself out on that part of the color spectrum and needed a breather. I’m thrilled at the moment by a very light green with a yellowish hint cotton that I’m using for a bolero. Yum! I think the current temperatures were a surprise to us all! So good for the mood though! I don’t know what will happen with the tulips. It’s the first time I am going to have some. They are already out… we’ll see! Colorwise, I’m in the TFA Year in Color club and just received the March shipment! I won’t say what it is just in case someone does not have it but I can tell you it’s lovely and inspiring me to knit a beautiful little shawlette! I have some mint green and egglplant Wensleydale yarn that I have been enjoying staring at for going on two years now. I don’t know what it will become yet, and I’m not casting on until I have thought out the perfect project! I have been working on a handbag with my stash of Alpaca. Using black, charcoal, powder blue, and ivory. I also just finished a pair of fingerless gloves for my hairstylist. Next a baby blanket for a friend in a wonderful organic cotton. A nice pale lavender, yellow, and cinnamon, along with a variegated yarn. Beautiful.